Rivette Marketing Group creates market planning and supports product development worldwide. We have over 25 years of successfully producing, creating, designing and marketing products and services for a wide range of companies in dozens of industrial categories. Marketing support services are not all created the same. 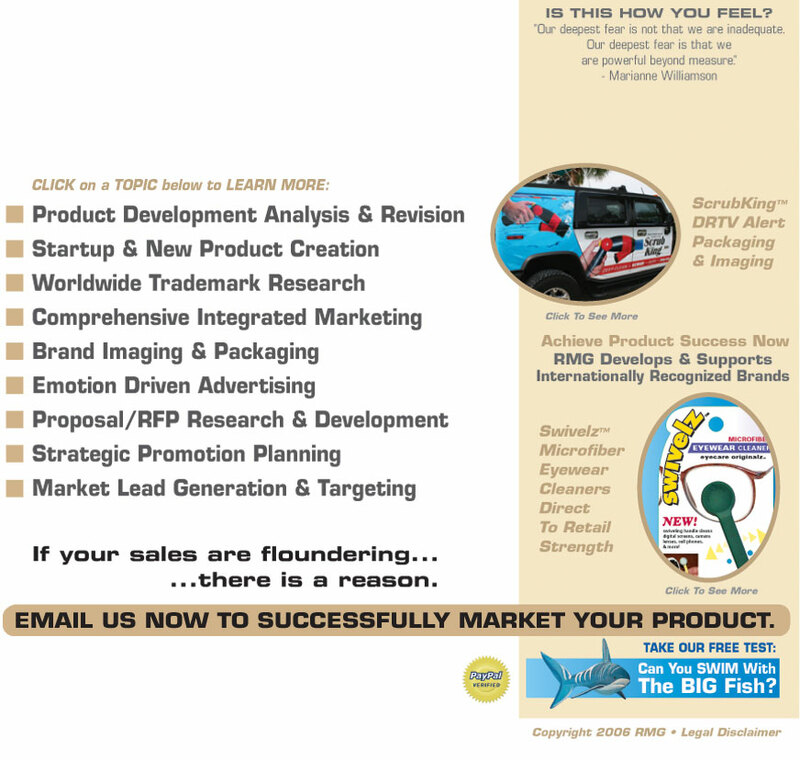 RMG or Rivette Marketing Group has the capability to bring greater sales to your firm. Our insight and ability to succeed cannot be exceeded. Advertising, marketing and genuinely good marketing support is obtained from RMG. Creative services are only a tool to complete the marketing mission. Too many people today believe that marketing starts with the marketing department, when in fact it begins with the attitude of the company ownership. Success in the business world can only be measured by success with the consumer, from brand loyalty market share to the profits of the bottom line. Any failure of your marketing plan to address key features which affect those two valuable measures is a direct result of lack of vision. Become the kind of company you tout to the public. Bring the kinds of products and services forward for the consumer that they want and need. Give them extra value and build brands worth sustaining. Call Rivette Marketing Group to achieve yours goals, because our specific ideas create tangible results. Rivette Marketing Group is a full service firm dedicated to providing successful marketing support for companies from product inception through launch to promotion and beyond!